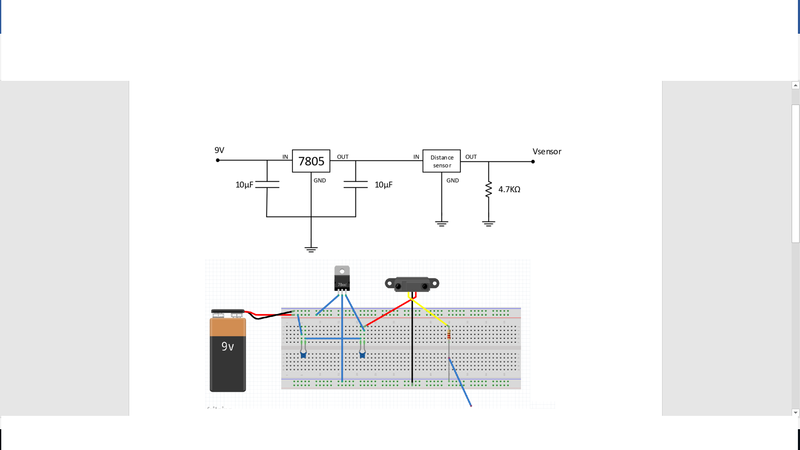 I need to build a circuit like this on the Breadboard of Fritzing… Can someone help? I’m completely new to this software and i don’t know nothing of it. Can someone build it on the breadboard and explain me why it is like that ? Upload the sketch (the .fzz file) via file upload (7th icon from the left in the reply tool bar) and one of us will correct it. I can already see that you have no ground connection (the battery isn’t connected to anything) so it won’t work as it stands. The four power strips (Two top and two bottom) connect horizontally but not vertically so you need vertical wires between them (or to move the black battery connection to the bottom ground rail which may be easier). The ground of the sensor is one bus too low on the bottom, it needs to connect to the same bus as the regulator ground (once the battery ground connects to the same strip). The output wire needs to go on the other end of the resistor (in the same place as the yellow wire) it is currently on ground and thus will not give any output. Also the 7805 GND is supposed to be a 4 point junction in SCH, not a line over a line. OK, here is a new copy of your sketch. change the capacitors to electrolytic use Inspector (bottom right window) to change the value to 10 uf 16V. Use right click rotate to align the positive pin correctly as polarity mattes. Move the battery black wire to the bottom ground strip. Note clicking on a connection will light in yellow all the connections for that net, so everything that should be connected ligths up yellow. Used right click rotate to align the resistor properly and Inspector to change its value to 4k7. After all changes are made in breadboard switch to schematic then place the parts correctly by dragging them in to position. Drag ground connections from core parts schematic for all the ground connections. Click on the ratsnest lines to wire them correctly then drag the wires to align them.